Excision - Paradox On The Rocks 60mLExcision and Alt Zero come together to bring you into the d..
Excision - Harambe 60mLExcision and Alt Zero come together to resurrect HARAMBE! 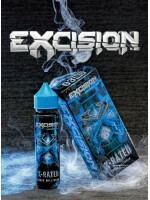 He's back and this ..
Excision - X-Rated 60mLRated X for strong use of sweet blueberry tart yogurt, may contain use of oth..
Excision - RoboKiTTY CreamExcision and Alt Zero come together to bring you RoboKiTTY Cream! Soft yel..
Excision - Paradox 60mLExcision and Alt Zero come together to bring you into the darkness with Parad..